There is good reason for the popularity of the hydraulic gear pump; they are simple, inexpensive, durable and interminable. I’ve seen them made from about five pieces if you don’t count seals and bolts, and it’s this simplicity that has resulted in their popularity both now and when your grandfather was installing them on grain mills. However, just as grain mills have come a long way in a hundred years, so have gear pumps. The gear pump uses two spur gears meshed together to carry fluid from the suction port around to the pressure size where it’s forced out the pressure port. One of the spur gears is driven by the drive shaft, but most often the drive gear and shaft are machined from a single piece. 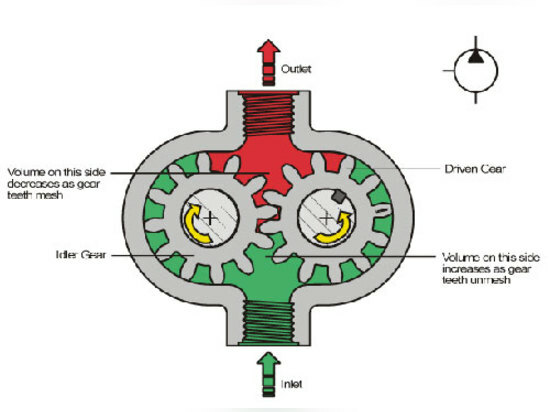 As the drive gear rotates, it pushes against the idler gear, creating a synchronous movement as both gears rotate in opposite directions while pumping fluid around their circumference. Early gear pumps were constructed of steel and cast iron because these materials were readily available, easy to work with and strong enough to withstand “high” hydrostatic pressure. Just as with anything at the turn of the 20th century this side of Swiss-made watches, the manufacturing quality of machinery left much to be desired by today’s standard. The metallurgy, and precision of the tooling, was not fine enough to achieve the tolerances we see in today’s machine tool industry, but they could be manufactured well enough to achieve more than 1000 psi, although not every efficiently. Pressure capability seems to be a relative observation to each generation, as even 1000 psi was a world-record at some point, and I’m sure our current definition of high pressure will seem laughable in another century. The nature of early hydraulic gear pumps meant that leaks were common but often ignored. The early sealing material and construction was of natural materials like leather or rubber, as synthetic rubber didn’t become commercially available until the middle of the century. Fortunately, with low pressure and only a couple seals even required in a gear pump, the leaks were manageable and easily remedied. Regardless of early machine and sealing quality, with relatively low pressure and robust construction, early gear pumps were reliable. Because of their clear limitations, engineering dollars went into the more advanced pump designs, such as vane or piston pumps. Achieving higher pressure capability has been a moving target for the fluid power industry since its inception, and although a piston pump can reach high pressure efficiently, the manufacturers of gear pumps still saw a place for gear pumps on inexpensive machinery, especially in the mobile hydraulics industry. Most manufacturers of piston pumps also manufacture gear pumps, and with the evolution of the piston pump, the trickle-down effect of engineering, technology and processes saw improvements for the gear pump as well. The improvements in manufacturing which were absolutely required to produce a piston pump were passed along to gear pumps. By the 1950s, hydraulic pressure capability doubled, and your grandfather would have had access to steel and cast iron gear pumps capable of 2000 psi. Stay tuned for part 2 of this discussion next week, as I delve into the modern evolution of the gear pump, with a look at a new quiet design. Illustration of an external gear pump. ©2001 Eaton Corporation. Reproduced with permission from Eaton.